Garmish-Parenkirchen might be the first ski resort that comes to mind when you think about Germany, but the less well-known town of Oberstaufen is a great winter holiday destination for skiers and non-skiers alike, nestled in the picturesque Allgäu region of Bavaria. At just 1 hour from Memmingen and Friedrichschafen airports it makes it a great short ski break destination – During the winter there are 5 flights a week from London Stansted, 1 a week from Dublin and 2 a week from Edinburgh, all with RyanAir; and 3 flights a week from London Gatwick to Friedrichshafen with Easyjet. The resort guest card includes a range of winter activities including the ski lifts, shuttle bus to the slopes and free parking, the ice rink for skating and curling, the Aquaria swimming pool and spa (see below), local museums and free WiFi hotspots around the town. With 45km of slopes spread across 4 different ski areas, you can find the area to suit you. Sinswang is for beginners, the Hündle / Thalkirchdorf and Steibis areas are great for intermediates, while the Hochgrat offers steeper runs for more experienced skiers. For Nordic skiers there are 80km of tracks, some of which are floodlit for those who want to go at night. 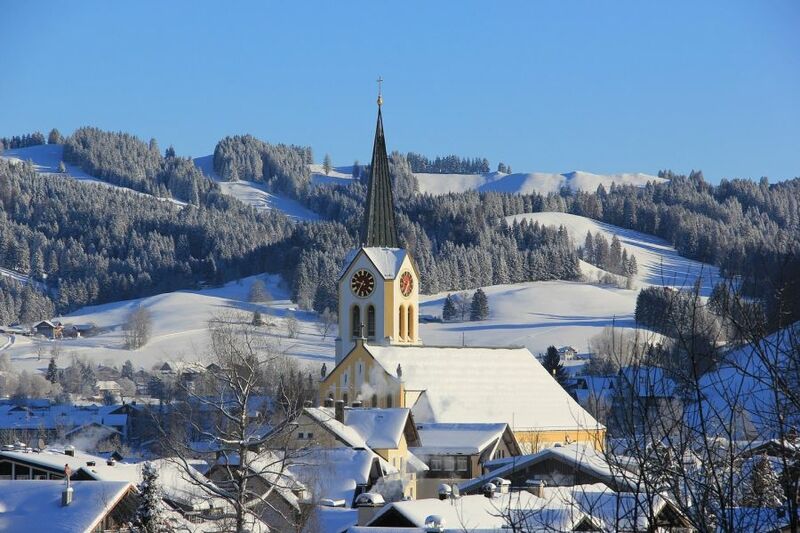 Ice rink, museums, snowshoe trekking tours, winter hiking, sleigh rides, farmers markets – you name it, there is lots to keep you busy on a winter holiday in Oberstaufen. Just ask at the local tourist office what is going on during your stay. Take a day trip (the lake is just over 30 mins by car) or alternatively head to Neuschwanstein castle (around 1 hour by car in the opposite direction), the latter is the most visited in Germany and the one that famously inspired Walt Disney who used it as a model for Sleeping Beauty’s castle. The local region is famous for its excellent air-quality and is rated as a ‘climactic health resort’ in Germany. As such the emphasis is on eating well and being active. The locally famous Schroth Cure is based on this philosophy and many people travel to the area for this reason. Also included on your O Plus card (but only if you are not skiing that day, if so you pay the entry fee) is this large swimming pool complex, great for families thanks to the diving boards and water slides, but also for those who want to relax and unwind in the saunas and steam rooms. If wellness isn’t your thing, Oberstaufen has a lot to offer in terms of bars and restaurants, from cosy pubs to trendy bars and a range of restaurants offering traditional local specialities to fine dining as well as Italian pizza and Thai food. Night owls can head to the 2 nightclubs. The resort’s location in the heart of Bavaria means you will receive a warm, friendly welcome from your hosts. So there you have it, a great destination for a ski break; snow, spas, nightlife and hospitality, what more could you want? Check out our new flexible ski break in Oberstaufen available now.